Most people find that shopping for a generic hunting bow is simple, as there are so many on the market, but finding the right youth bow can be slightly more difficult. The Barnett Recruit Youth 100 Crossbow Package is one of the few reliable bows designed for younger users who aren’t quite ready to harness the power of a professional crossbow but are surely interested in learning about hunting and archery. Available in two colors (pink and black) with a few uncommon trimmings, it could be the ideal setup for your children or students. The main purpose behind the Barnett Recruit Youth 100 Crossbow Package is to give younger kids the ability to understand how to use a crossbow, especially when it comes to hunting for food or protecting themselves in the wilderness. Luckily, this particular model is equipped with plenty of features that are similar to traditional crossbows, which is more than ideal for teaching a younger audience the full particulars of a regularly sized bow. The Barnett Recruit Youth 100 Crossbow Package is also clearly designed with ease of use in mind, as too many bells and whistles can be confusing and difficult for beginners to learn. With that being said, just because a youth bow doesn’t mean that it doesn’t pack a powerful punch, as this model reaches shooting speeds of up to 256. Children and small teens are the two main categories of people who will benefit from the Barnett Recruit Youth 100 Crossbow Package the most, however, it has such a versatile design that even adults will be able to use it to their advantage. First and foremost, this crossbow is ideal for teaching children how to safely operate weaponry and it can also be a great tool to have for an archery class. As it’s specifically designed for a younger audience, you can guarantee that it’s very easy to use for teaching purposes. Smaller adults will also be able to benefit from using the Barnett Recruit Youth 100 Crossbow Package, especially if they aren’t able to deal with heavy draw weights typically associated with other adult-sized bows on the market. Before deciding on a single crossbow, it’s important to think about all of the features that it has to offer. 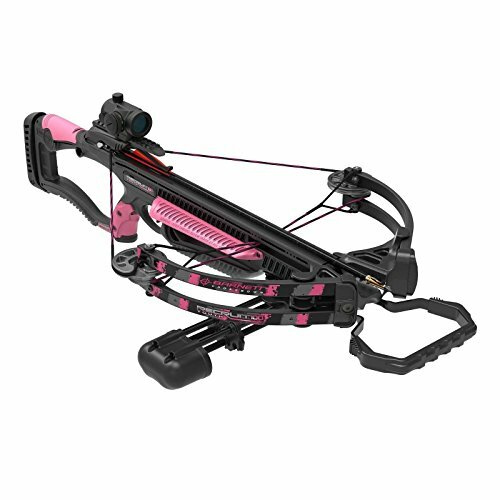 As one of the largest selling points of the Barnett Recruit Youth 100 Crossbow Package, it showcases an assortment of features. Easy to sight-in: When you first receive the bow and need to sight it in, you’ll easily be able to have it deadly accurate at 20 yards with only three shots. Versatile design: Although the Barnett Recruit Youth 100 Crossbow Package as a 256 FPS, it’s more than enough speed to zero in on smaller types of game and still delivers deadly blows. On the other end of the spectrum, you can also use it for generic archery practice. Easy draw weight: In comparison to the draw weight on compound bows, this crossbow only has a 100-pound draw weight, which is easy enough for a 12-year-old to handle on their own. Simple to assemble: Not all of the attachments come equipped on the bow during delivery, however, with the help of instructional videos you can assemble all of the pieces in under 10 minutes. Very stable performance: Most crossbows are difficult for children to manage, however, the Barnett Recruit Youth 100 Crossbow Package is incredibly stable which helps to deliver better accuracy. Ambidextrous safety: For a safer shooting environment, there’s a safety switch included on both sides of the SA Sports Fever Crossbow Package and this feature is not included in the Barnett Recruit Youth 100. Adjustable scope mount: Another feature that might prove to be quite useful depending on how you want to customize your crossbow is an adjustable scope mount that is included with the SA Sports model and not the Barnett. However, when it comes to performance and durability, the Barnett Recruit Youth 100 Crossbow Package is far superior, which is what makes it the ideal choice. With an assortment of attachments, easy to use features, and components that are easy enough for an eight-year-old child to use to their advantage, the Barnett Recruit Youth 100 Crossbow Package is a phenomenal youth bow to take into consideration. Regardless of if you are buying a crossbow for your kids if you’re interested in learning how to shoot a crossbow yourself, the Barnett Recruit Youth 100 Crossbow Package is an affordable, lightweight, and user-friendly model to have on hand.